I’m back today to share a new layout with you, using the August 2015 Hip Kit & Add-On Kits. I decided to go big on this layout with a large photo. One of the “big” advantages to using a big photo, is the fact that it’s a big time saver! :) A large photo adds impact to your layout, but gives you the freedom to feel less pressure in filling up your layout with lots of other stuff. My normal time span for creating a layout is anywhere from 1.5 hours to two hours. This one took me 45 minutes! A time saver like that, gives you more time to start working on a second layout (because honestly, who wants to do housework and laundry!!)! I wanted to have something in the background of the layout, but I didn’t want to use a busy patterned paper. I decided to go with the Gold Dot Vellum from the August Paper Add-On Kit. I adhered it to a piece of White cardstock from the August Cardstock Add-On Kit, by stitching around all of the edges. I placed my photo along the right edge of the layout, and started out by adding my title and some embellishments over the White space in the photo. I used one of the Flair Buttons from the August Embellishment Kit and some of the Pinkfresh Studio puffy stickers from the August Main Kit. I wanted to add a pop of color and define the edges of my photo, so I used several tags from the Crate Paper Wonder Bits & Pieces included in the Main Kit to add a long the top of the photo. And I also mixed in some of the CP Bits & Pieces with one of the Pinkfresh Studio rubber charms to create an embellishment cluster at the bottom of the photo. 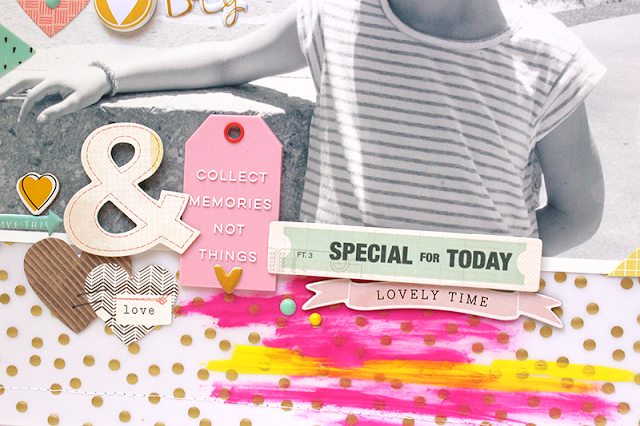 And I couldn’t resist playing with the Dylusions Paints included in the August Color Add-On Kit, so I used a large brush to paint the Bubble Gum Pink and Lemon Zest colors over the Gold Dot Vellum. 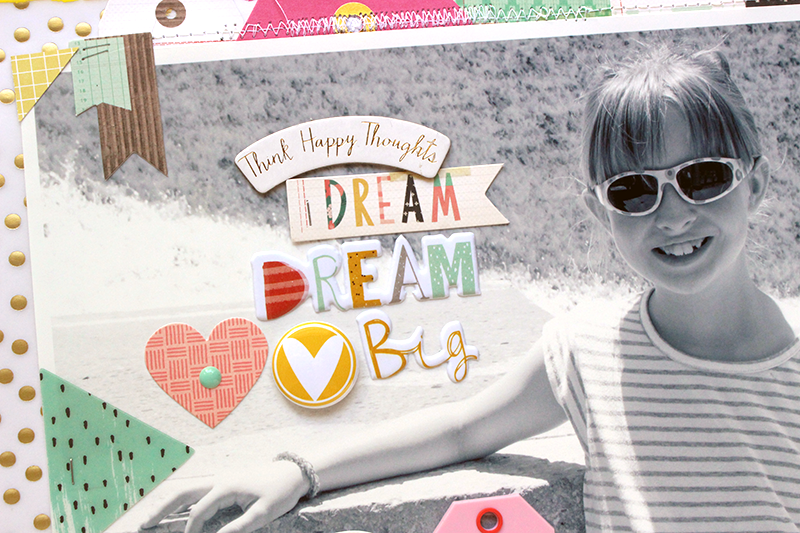 I love that there are endless possibilities to the designs you can create, using the monthly Hip Kits! It’s always fun to see how everyone uses the same products in so many different ways. I’ll be back next week to share another layout with you, using the August Kits and I can’t wait to get my hands on the new September Hip Kits that are coming soon!